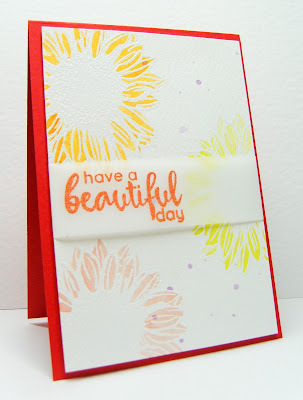 -the water colour look-I am not sure if Jenni's card is water coloured but it looks it! The colours at Colour Throwdown really caught my eye this week. I thought it an usual combo but loved it and wanted to have a play. 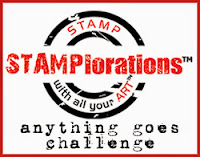 I used my new stamp from STAMPlorations, heat embossed it in white then used water colours in orange, red and yellow. I then just splattered some purple paint around. The sentiment was heat embossed in orange. I placed the card onto a red base as I thought my red water colour paint was quite pale and wanted to add a more vibrant red. Although in the photo it appears orange, I assure you it is red! This was fun to make and the water colouring very relaxing. Fabulous! I live everything about it. Lovely background paired with the vellum belly band! Thanks for joining us at Color Throwdown! Sunny, warm and so pretty! Love that you're stretching your comfort zone with watercolour! Thanks for joining us at Muse this week, Sandie! Love the vibrant and sunny colours! They are combined so beautiful! And congrats at being "Chick of the week"at Just Us Girls! Have a good weekend! So beautiful...love those sunny colors! Such a pretty card, Sandie! I love the soft coloured flower background. So happy and bright Sandie!! I love these colors! Your watercoloured flowers look so soft and are simply beautiful, Sandie!!!! And the yellow with the orange and red do look lovely!!! Wonderfully done, my friend!!!! This is gorgeous - love the subtle colours! Such a pretty card. Beautiful colours. I think you managed to keep this vibrant card both stylish and non messy. I went in a totally different direction being inspired by graffiti as well as these colors. Or maybe I was thinking tagging, I don't know, lol.